This mod adds various ores from vanilla as well as other mods to their dimensional alternatives. Is there a way to tweak the spawn rate of the ores? I can't see anything in the config file. Not yet, I plan to add this in the future soon. Also for what generates where. Like only enable some ores for the nether, and only coal for the end. Or can you already do that? Yes, you can already do that in the config. Psssst. Your Aluminum is ore-dicted with the British spelling "aluminium", yet every single other mod uses the US spelling, so it doesn't actually... do anything! It also spawns Uranium far too often, and it seems like all of your nether/end ores can be mined with a stone pick. Is this compatible with NetherEx biomes? I do not add special support for NetherEx, but this doesn't mean that it isn't compatible. 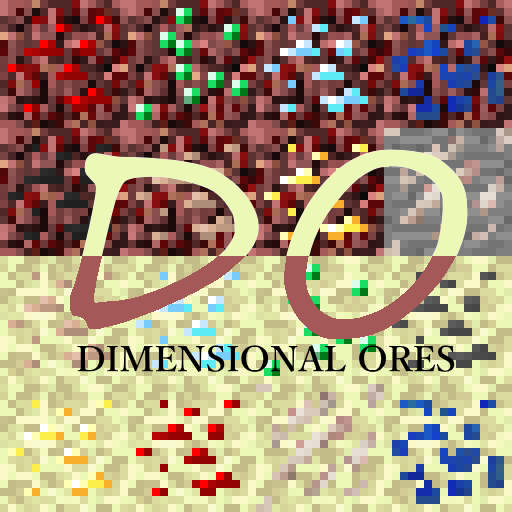 Though it has not been tested, the nether ores added by Dimensional Ores should be supported and generated in the biomes. Setting overworld world gen ores to false appears to fix it! I had only sulfur and quartz enabled for the overworld so maybe its related to that. Maybe you can find exactly what causes it. The formatting for that line doesn't match the other options. Thanks for the info, I'll investigate this issue. Just please note, for the future, please report all issue to the issue tracker as the replies on the project page are likely to be looked over. Will this work with a pre-existing world? Not by the mod alone. Note: This has not been tested and may not work. If i haven't entered the nether or end, would i still need to use simple retrogen? In that case, no it should work fine since the worlds haven't been generated yet. Can't wait for the config file for ore tweaking! Coming sometime soon in the near future. Working on some other mods and other projects when I can. It'll be there soon!